← The Ghost of MoFo Yet to Come. Vegan MoFo has begun! What a great kick-off… with the posts already coming in fast and furious, faithful readers have much blog-reading to do! Naturally enough, with MoFo coming in November this year… Day One of MoFo offered lots of Halloween recapping, and lots of pumpkin recipes. And, where there are pumpkin recipes, there are sure to be sweet potatoes too. Musings From the Fishbowl offers a really wonderful, step-by-step guide to roasting your pumpkin and transforming it into homemade pumpkin puree. My own mother, who is a very practical lady, taught me from an early age to salvage the jack-o-lantern off the front porch and turn it into dinner, so this post is very much after my own heart. Similarly, “Cooking Green Food up North” has her very first encounter with cooking and eating pumpkin. What a momentous occasion! She’s got 15 more cups of pumpkin puree, so I’m sure she’ll be happy to take suggestions. Maybe she should try Swell Vegan’s Maple-Glazed Pumpkin Cornbread! If you’ve had enough pumpkin and want to eat some sweet potatoes instead, the mofoers are there for you. 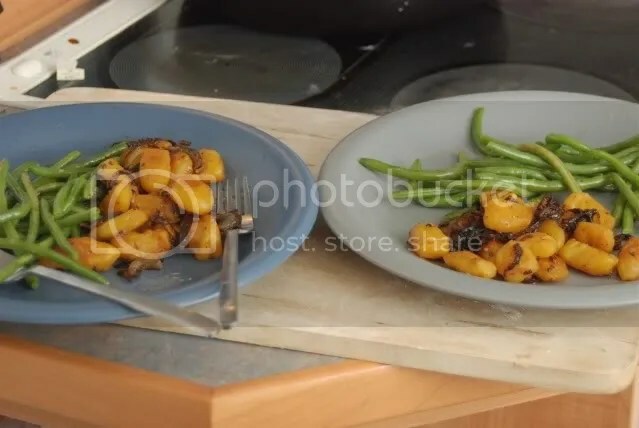 First of all, check out Vegan Soul Power‘s excellent pictorial step-by-step on making lovely orange little Sweet Potato gnocchi. Mmmmmmmmm! Usually, I’m not the biggest fan of burrito pictures on food blogs. You know, it’s hard to make a burrito into something photogenic. BUT apparently Super Vegan really does have super powers, because somehow this sweet potato and black bean burrito really caught my eye. Of course, some people just like it all, and My Vancouver Kitchen cooked up a tasty spread of pumpkin AND sweet potato goodies– pumpkin brownies, black bean and sweet potato chili, roasted pumpkin seeds… mmm! Plus, not related to pumpkin, she made donut holes. And really, who can resist donut holes?! Last, but not least, and totally unrelated to the stream of pumpkin and sweet potato blog posts, Liz over at Food Snobbery Is My Hobby posted about some amazing hickory nut scones. I want one! 9 Responses to VeganMoFo Roundup: Day one in all its GLORY! nice round up bubs! reading through over 600 blogs is no easy feat. Thank you, Amey! Beautiful round-up, and I agree with Kittee – reading that many blogs, *really* reading them, is a lot of work – bravo! Thanks for doing the hard work for us! hmmm. i’ve never had good gnocchi; but maybe i’ll give it another go by reviewing that recipe soon. I was eyeballing those scones as well! This is a fantastic roundup! Thanks for the shout out! Those scones are nearly gone already- I have to figure out how to score some more hickory nuts!